The Australian blogger was in Banff, Alta. when she discovered an inauspicious book of writing prompts that would change everything. 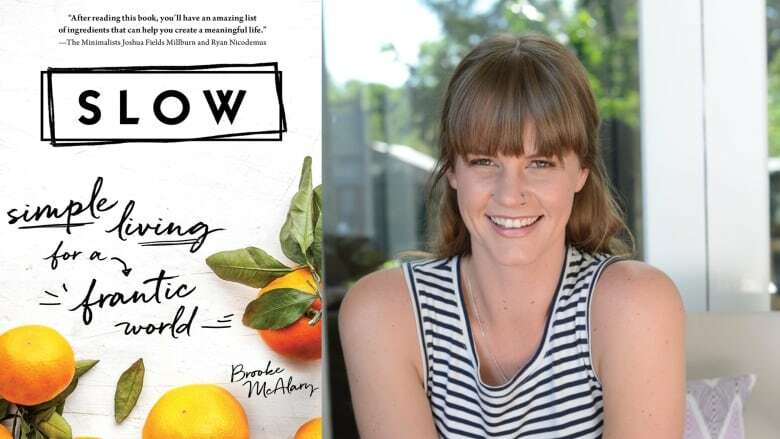 Australian writer Brooke McAlary was on the road to recovery from post-natal depression when she discovered the philosophy of "slow living." In a nutshell, slow living is about living mindfully and letting go of the physical things that clutter life. McAlvary embraced the concept and went on to write a book about it: Slow: Simple Living for a Frantic World. Below, McAlary describes how she became a "slow living" convert and why she wanted to share this journey with readers around the world. "I first discovered slow living after being diagnosed with post-natal depression. Prior to that I had been living this fast paced, hectic overwhelming kind of life, much like the lives most people tend to live. I was sitting in my psychiatrist's office after about three months of treatment and I was complaining to her about how busy I was, how I never got to enjoy my life or enjoy time with my kids and husband or anything in this great life that I was lucky enough to have. I was always doing the next thing and the next thing and the next thing. She just asked me point blank one day, 'Have you ever considered doing less?' That was the first time I'd ever considered it, but it was what kick-started this journey toward slow living." "I Googled, 'How do I simplify my life?' and discovered minimalism. That's where I began. I began by de-cluttering my home, my wardrobe, my car and my kids' toys and discovered that by simplifying and letting go of physical stuff, I had also started to let go of emotional clutter and mental clutter. That was when I first recognized how powerful the idea of slowing down was." "There have been many, many challenges. One of the biggest shifts I needed to make was once I began de-cluttering, I became too focused on de-cluttering as a solution to problems that it wasn't going to fix. I was counting the items that I was de-cluttering just so I could feel this sense of achievement. About 12 months into the process, I realized that it wasn't making me any happier. I was just trying to keep up with a new set of Joneses. That was actually when I shifted my perspective away from de-cluttering and simplifying in that physical sense and started to focus on the kind of life I wanted to live. "That happened in Canada. My family and I took a holiday there in 2014. I picked up this book of writing prompts in a bookstore in Banff. I flipped through the pages and the first writing prompt I came across said, 'Write your eulogy in three sentences.' That's a big heavy question, something that I wasn't expecting to face when I opened that book. But it caused me to sit down and really sit with the discomfort of such a huge question. While we were in Canada four years ago, I wrote my eulogy and I think that marked the turning point from simply de-cluttering to actually starting to live a slower, more intentional, more mindful life." "Ironically, it's quite complicated to simplify a modern life. The challenges that I had to face up against were things like my relationship with technology and how much time I would spend on my phone and my computer. How do you begin to live more mindfully when your status quo is mindlessness? That's what the book delves into — all the strategies and tools that I used to do that." "It had been difficult for me to make changes over the previous seven years. I would read a lot of blogs and books about simple living and all of them added up to this wonderful picture, but it all felt overwhelming. It all felt intimidating and time consuming and countercultural. I didn't necessarily know if I was ready to dive head first into all of it. It took me a long time to realize that the best way to make these changes was gradually, one small change at a time, one small task or action every day. That's what I wanted to come out of the book. This idea of slow, it's not just about slow living but it's also about making changes slowly. I wanted to encourage people that no matter how busy and full and hectic their life is, it is possible to find these small moments of slow every day." Brooke McAlary's comments have been edited and condensed.